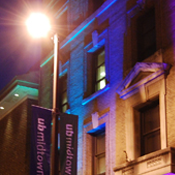 When Artscape comes to Baltimore every July, UB finds itself in the midst of the action, surrounded by eclectic art and food vendors, performance stages and the hundreds of thousands of attendees who inundate UB Midtown to partake in the country’s largest free arts festival. To say the three days of festivities are colorful is an understatement. Not to be outshone, UB took the spotlight—literally—in 2010 and 2011. Thanks to Image Engineering’s programmable LED light displays, the Academic Center’s northern-most Charles Street side adopted a constantly shifting rainbow façade that lit up the summer nights and showed off our community spirit.